Although television and movies have taken over the realm of political satire and futuristic visions, this was not always the case. A play like Shaw’s “The Apple Cart” of 1929 not only combines the two but is still amazingly topical and accurate in its predictions. The plot, such as it is, exists primarily as a framework for Shaw’s satire. In the first half we meet two of the king’s secretaries who introduce the general set-up of the play. Then follows a long interview between the King of England, Magnus, and the Labour Leader, Mr. Boanerges. The first half culminates in a stormy meeting of the King, Prime Minister and cabinet during which the Prime Minister gives the King the ultimatum to remain as king with no power whatsoever, without even a veto, or else the cabinet will resign en masse. At the centre of the play is an extended interview between the King and his ambitious mistress Orinthia, a model of everything a ruler should not be, no matter how alluring. After this, the play parallels the first half with the introduction of Jemima, the King’s wife, and long interview with the American ambassador who announces that the United Stages wishes to rejoin the Commonwealth. The second half culminates in another stormy cabinet meeting during which the King answers the ultimatum with one of his own. The tone and subject matter concerning the relation of big business, democracy and monarchy are remarkably like those in Gilbert and Sullivan’s most political operetta “Utopia Limited” (1893), except that instead of locating the action on a far-removed place like a South Sea island, Shaw has placed it in a removed time—forty years in the future. Director Richard Greenblatt duly updates the action for the contemporary audience to the year 2040. As a comedy of ideas, this play is not for everyone. It finds an appropriate home at the Court House Theatre of the Shaw Festival, where audiences have learned over the years to appreciate unusual works. Before the play even begins, Greenblatt lets us know what we’re in for by having pertinent excerpts from Shaw’s preface to this play and “Geneva” projected on the left and right walls of the theatre. Even designer Kelly Wolf’s backdrop and the furniture of the set before us have words of important concepts painted or embroidered on them. Suitably prepared, we are ready to plunge into Shaw’s thoroughgoing satire of democracy. As Shaw makes clear from every possible angle, although everyone may hold to the notion that democracy is good and right, the true power even self-proclaimed democracies is not arrived at or wielded democratically. In Mr. Boanerges we see a labour union boss who can command the unions to do as he says. In Balbus, the Home Secretary, we see a man whose brother runs Breakages, Limited, the most powerful company in Britain, that ensures all products conform to what we would now call planned obsolesce and has all the main politicos in its pocket. In Ms. Vanhatten, we see a representative of the world’s greatest power who explains as nicely as she can how the US would like to “merge” with the Commonwealth, i.e. take it over completely. “How long until the capital moves from London to Washington”, the King wonders aloud. This, along with discussions of manufacturing in Third World countries to save labour costs at home, of what we would now call the globalization of trade and culture and of the media becoming more entertainment than information makes one wonder again and again how, if Shaw saw this happening in 1929, we can pretend these are new problems. While the ideas are consistently intriguing, the characters Shaw has written are, with a few exceptions, primarily mouthpieces for various points of view. The Shaw festival company, after 37 years of dealing with this frequent quirk in their titular playwright, are able to bring off this kind of play more successfully than any other company in the world. It’s often been said that it is the acting itself that makes characters of these mouthpiece figures, and the cast here is uniformly strong. The central figure of the play is King Magnus himself, a role that has attracted the likes of Cedric Hardwicke, Noel Coward and John Neville. Paxton Whitehead played it twice at the Shaw (1966 and 1976); David Schurmann plays it now in the play’s first revival since Whitehead. Suitably for a satire on democracy, it is the King who alone sees through all the bluffs and posturing around him. Schurmann’s tone is ideal for a character who shifts constantly between irony and sincerity, self-possession and worry. He is excellent at showing an outward security simultaneous with an inner knowledge the world he “rules” is already slipping from his control. The most powerful character as a character is the one who has no political power at all—Orinthia, the King’s mistress. Once-Canadian, now Australian actress Pamela Rabe is absolutely outstanding in this role. She has only one scene in the play but it is so highly charged that it alone is worth the price of admission. Orinthia believes that she, not Jemima, should be Queen since she has a strength of personality beyond anyone in England. Indeed, she claims that she is a goddess worthy to be adored—and Rabe is so commanding and persuasive we believe her! Yet, her utter disdain of politics and of those she would rule mean, as the King well knows, that she is exactly the one who should not rule. It’s an amazing performance. The sexual tension between Orinthia and Magnus is something one hardly ever sees in Shaw and Rabe and Schurmann play this up to the fullest. One can only reflect how in Rabe Australia’s gain has been Canada’s great loss. The next largest roles are all excellently cast and played—Michael Ball as the emphatic but easily swayed labour leader Boanerges, Wendy Thatcher as the dowdy but sensible Queen Jemima, Peter Millard in a fine comic turn as the apoplectic Prime Minister and Lynne Cormack, hilarious in the role of Ms. Vanhattan (“Mr.” In the original), the aggressively friendly (though, in fact, merely aggressive) American ambassador. The cast was filled out with Roger Rowland and Kevin Bundy as the King’s two secretaries, Fiona Byrne as the King’s daughter and Anthony Bekenn, George Dawson, Sandy Webster, Craig Gardner, Corinne Koslo and Camille James (the last two also female in the original) as the various cabinet members. All, no matter how small the part, instantly pinned down their character’s temperament, Koslo, having the largest of these, bringing an emotional depth to her part. This kind of play is a designer’s dream. In Kelly Wolf’s conception, high-collared frock coats with waistcoats of the late 18th century have come back in style for both men and women, except in vivid colours and with asymmetric lapels. The trendier the character, the more bizarrely moussed the hairstyle from Bundy’s simple swoop to Bekenn’s and Rabe’s multiple swirls and tints, the English style contrasting with the American’s blonde cheerleader do. With short hair and a simple white-and-gold suit, Schurmann as Magnus stood out from all the rest, as he does in the action. While the costumes supported the theme of a period of revolution, I found it hard to believe that Ball’s Slavic peasant outfit would make a come-back even for a labour leader. I didn’t mind the addition of various forms of ultra-miniaturized PCs though it may have confused some people. All was well-lit by Bonnie Beecher and accompanied by John Millard’s lovely arrangements of poems by Burns and Blake. Richard Greenblatt, in his first stint at the Shaw, knew how to keep a certain amount of stylization as befits a satire without going so far as to make all the characters into caricatures. He gave enough action and energy to the cabinet meetings to keep them from feeling static, but excelled in the Magnus-Orinthia scene where there was more room, physically and emotionally, to create tension. Anyone interested in the byways of Shaw’s output, in politics or in predictive fiction should not hesitate to see what Shaw aptly subtitled “A Political Extravaganza”. 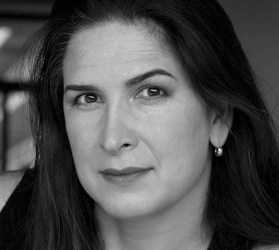 Photo: Pamela Rabe. ©2012 Sydney Theatre Company.